That’s what we had read about the Marlin Azul cantina in Merida. 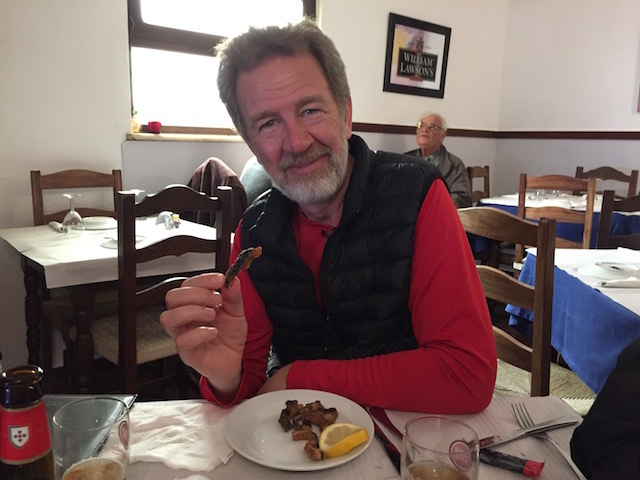 After my sister said she and her husband had enjoyed delicious shrimp fajitas there Dave and I decided to try it on our trip into Merida yesterday. Once we were out of our Uber we got a little direction turned but there are these English-speaking tourist guides hired by the city at many key intersections and this man named Roberto was happy to point us in the right direction. When we got a little turned around again direction wise this gentleman kindly stopped and offered to take us to the restaurant. He led us right to the Marlin Azul and the outward appearance lived up to the descriptions we had read. So did the descriptions of the friendly service. 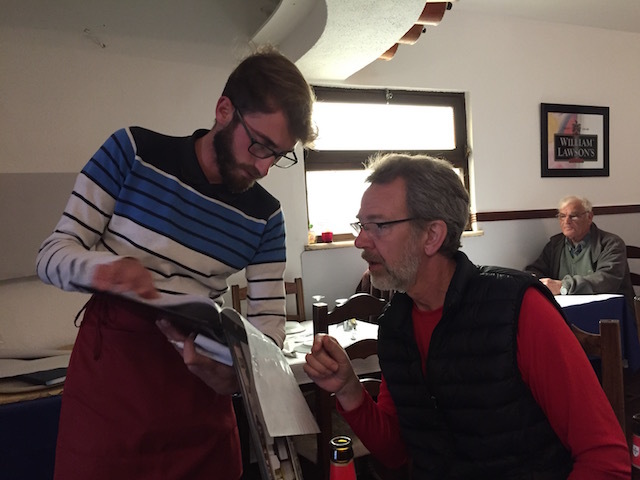 This affable waiter helped Dave pick out the perfect beer to go with our meal. And the food certainly lived up to its hype. The shrimp fajitas we shared were wonderful. We were about to set off on an eight kilometer walk around the city to explore some of its art galleries. Our meal at the Marlin Azul fortified us and got our afternoon off to a perfect start! On Friday my friend Esther and I paid a visit to the Amsterdam Tea Room just beside Old Market Square at the heart of the Exchange District. I had been there before for tea but never for a meal. As the name of the restaurant indicates there is a distinctly Dutch flavor to the menu items. I had a vegetable sandwich with beet soup and Esther had the endive, pear, grape salad with the pea, celery and leek soup. They have dozens and dozens of kinds of tea on offer at the Amersterdam Tea Room. I opted for the Pina Colada tea and Esther chose a chai blend. 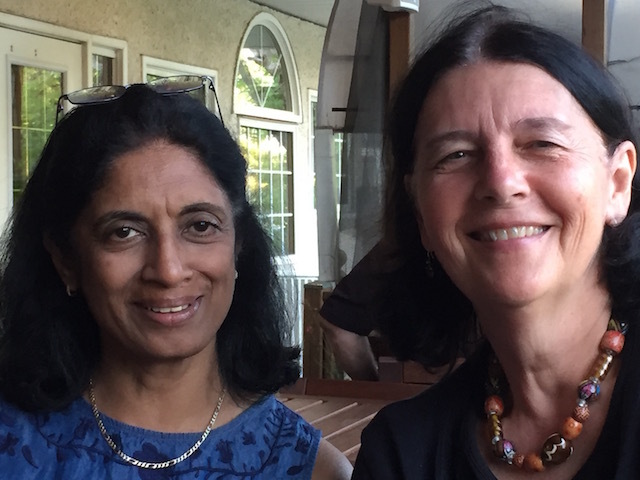 We had a lovely meal at a sunny window table and caught up on what had happened in each of our lives since we last got together. We had planned to sketch in one of the many art galleries in the Exchange but it was such a gorgeous day we sat at a picnic table in Old Market Square to work on some new pages in our sketch books. Winnipeg, we decided, is a beautiful place indeed on a fine fall afternoon! Yesterday we did a little road trip I had read about in a travel article. 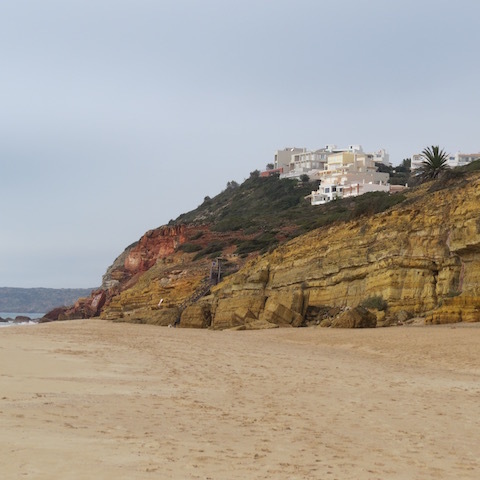 We headed west from our house in Praia da Luz to the village of Salema. 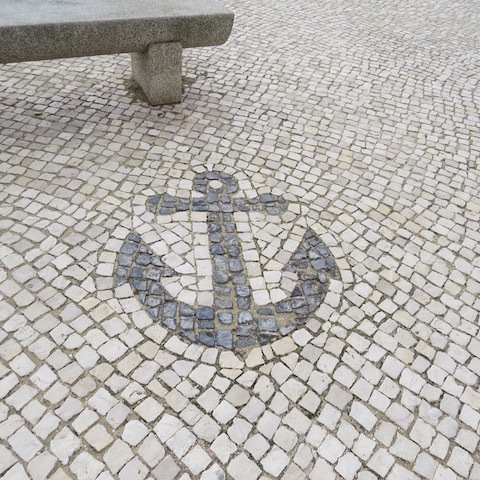 The cobblestone decor made it obvious we were in a place that is dependent on the sea for its livelihood. We went for a walk along the beach. 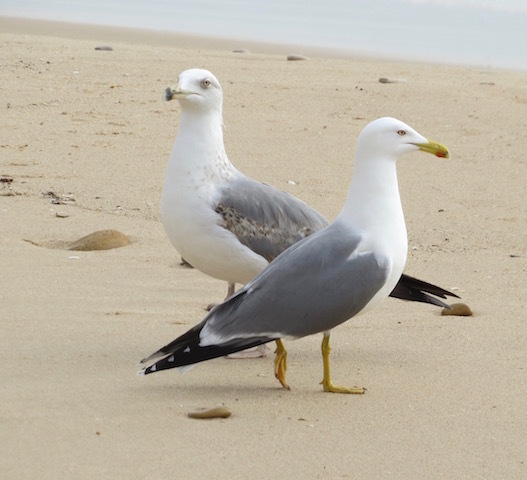 Although in summer the beach is said to be extremely popular and crowded with tourists we shared it with only a flock of gulls and a group of fishermen who were repairing their nets. 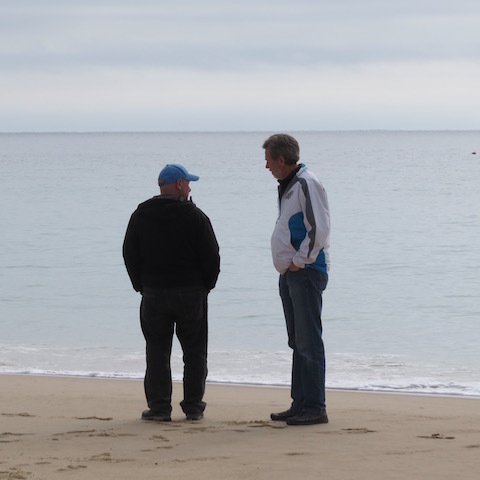 Our friend Rudy got into quite a conversation with one of the fishermen and Dave and I listened as he explained in his limited English that their main catch was octopus. 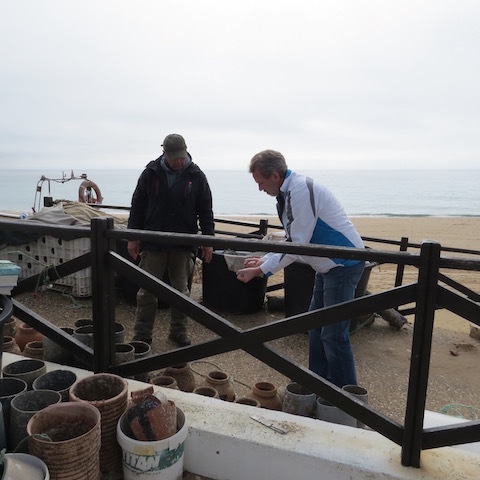 He showed us the terra-cotta and steel pots they use to catch the octopus. This fisherman owns literally thousands of them. The pots are all roped together on lines that can stretch for 20 kilometers or more. 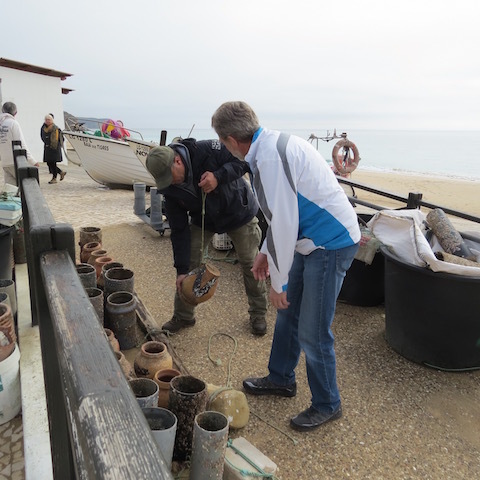 The octopus like being inside the pots because it is safe and secure, kind of like a cave for them, so once the fishermen have reeled the pots in they put a spot of bleach into the pot which chases the octopus out. They sell the octopus to restaurants. 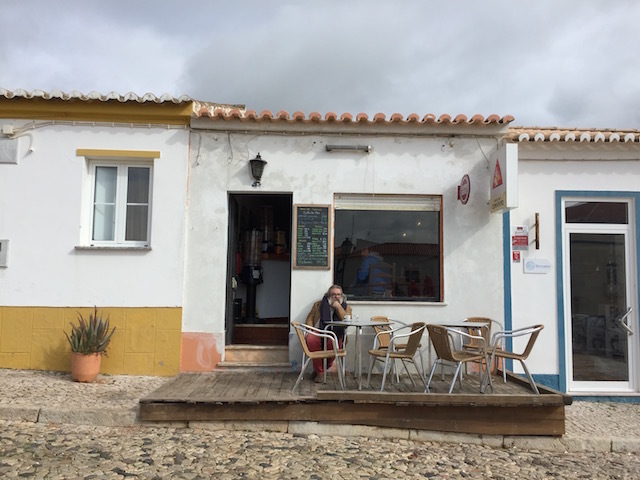 I had read one needed to stop in Vila de Bispo to taste the goose necked barnacles, so we found a tiny restaurant there for lunch. 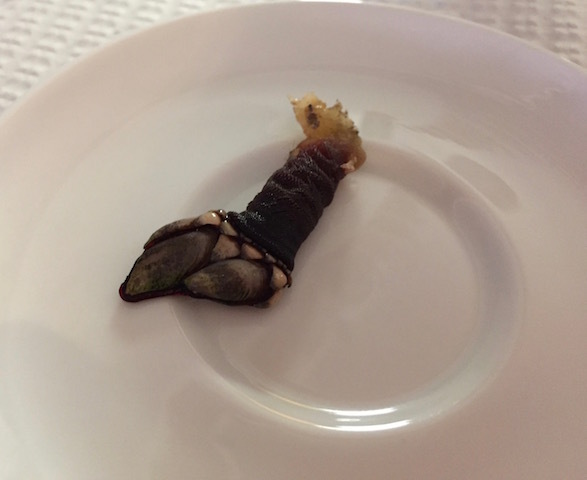 Our helpful waiter David brought out a plate with a goose necked barnacle for us to look at. It made Dave and I decide to eat something else so we ordered sandwiches. Our friend Rudy was more adventuresome and asked the waiter for suggestions. He ended up ordering the fried moray eel. Rudy said it was good but there wasn’t much of it so Dave and I shared our sandwiches with him. While we were eating a couple came over to talk to us and asked if we were from Manitoba. They had noticed Dave’s Winnipeg Jets hat. Turns out they were from Manigotagan and ran a campground there. 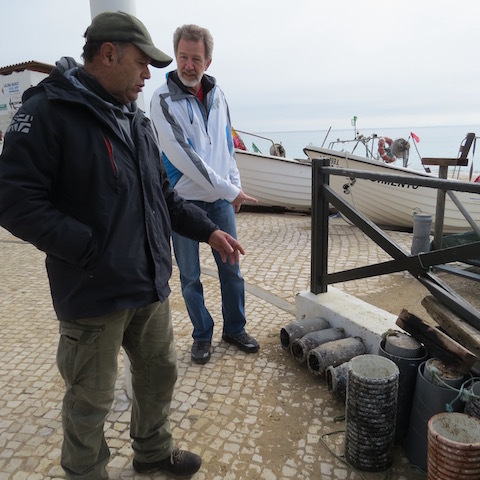 They were traveling through Portugal and checking out the Portuguese campgrounds. Rudy who has been an avid biker in the past, also stopped to chat with a group of bikers from Great Britain. The cook kept coming out from the kitchen during our meal to check on us. She couldn’t speak English but her cheery voice and smiling face made it clear she hoped we were enjoying our food. We didn’t order dessert but she brought out a small slice of some lemony kind of pie for us to share anyway. After our meal we got back into our rented car and headed off for more adventures. 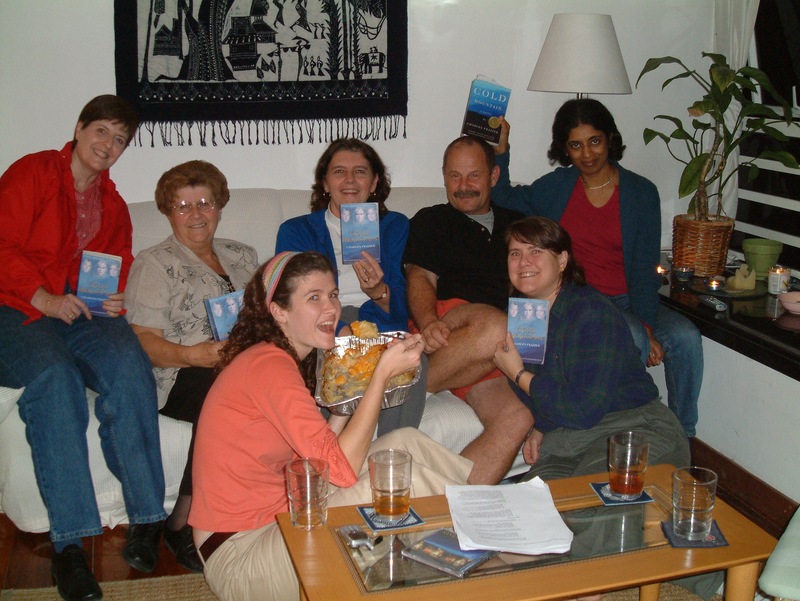 We’d learned how to catch an octopus and what a goose necked barnacle was… two things we didn’t know before our road trip began. Dave checks out one of the many restaurants he considered for dinner. It took Dave a long time to decide where he wanted to eat supper our first night in Lisbon. He checked out a whole bunch of places but finally decided on a small restaurant near our house run by an elderly couple. They couldn’t really speak English but we managed to communicate quite well with hand gestures and pointing to menu items and the owner helped us pick out what to have after supplying us with a plate of olives and a tray of bread. 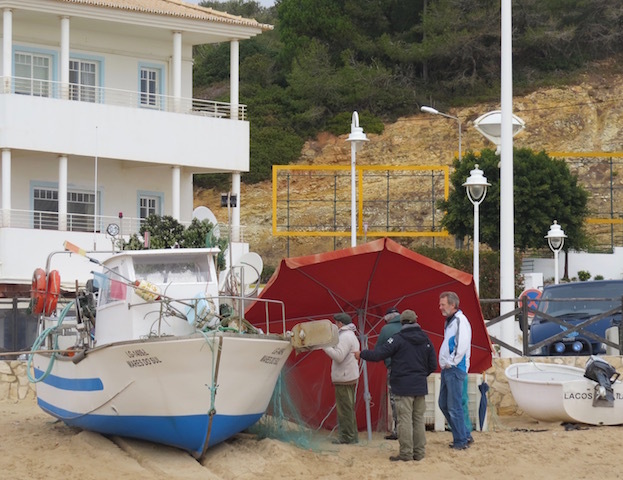 The owner left to buy the tuna and sea bass we had ordered from a nearby fish merchant. We watched his wife prepare our pitcher of Sangria step by step. She chopped oranges, splashed in wine, added other fruits she had already diced, threw in ice cubes, and then tasted the Sangria herself to be sure she’d got things right. Just then the owner returned with our fish and his wife took it and bustled into the kitchen to cook while the man chatted with all kinds of people from the neighbourhood who stopped in to visit. The meal was AMAZING! The fish was flavorful and the homemade potato fries done to perfection. There was a plate of salad for each of us included as well. We ordered a carafe of white wine for our meal. The portions were so hearty we simply COULD NOT find room for dessert although our host really wanted us to. Before we left I asked our host if he would take a photo with me. I wish I had taken one with his wife too. She came out of the kitchen just before we left and we told her how great the meal had been and she smiled and said some stuff in Portuguese that sounded happy and pleased. We did stop on the way home to get a bag of oranges. There are orange trees everywhere in Lisbon. The man who sold us the oranges told us they’d be sweet and was he ever right! He also taught us to say obrigado which is thank you in Portuguese. Later I looked up the restaurant which was called O Tasco Do Vigario on Trip Advisor and everyone just raved about it saying what a fabulous full course meal they’d had with cocktails and wine for two people for only around 20 Euros. Everyone gave it four or five stars! Our experience exactly! Kudos to Dave for choosing the perfect place by instinct! One of the favorite places my friend Esther and I like to meet for visiting and sketching is the beautiful Folio Cafe on the Canadian Mennonite University grounds at the corner of Grant and Shaftesbury Avenue. Big windows provide plenty of light. 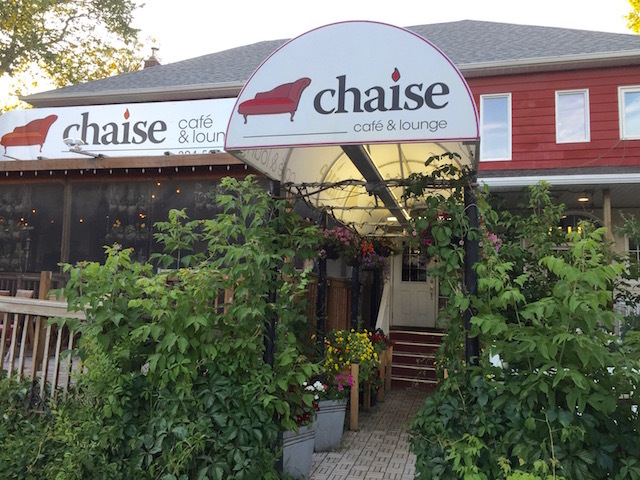 There’s a patio where you can eat on nice days. The lunch items are delicious. Homemade soups and sandwiches and desserts. Last week when I visited I ordered the beef borscht and a sandwich with goat cheese and marinated tomatoes on crusty fresh bread. For dessert there was a lovely latte and gelato. After lunch I drew my own versions of portraits of artists Picasso and Tom Thompson. The Folio Cafe is spacious and welcoming and it is easy to spend several hours there visiting and drawing in the comfortable airy space the cafe provides. If you’ve never been to the Folio I suggest you give it a try. Just in case you haven’t already heard it is Burger Week in Winnipeg. Nearly a hundred restaurants in our city have custom designed burgers for their patrons. 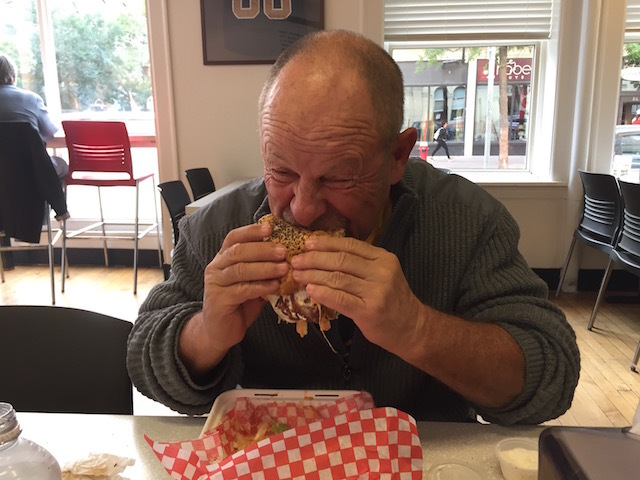 We decided to try a burger at Shawarma Khan. 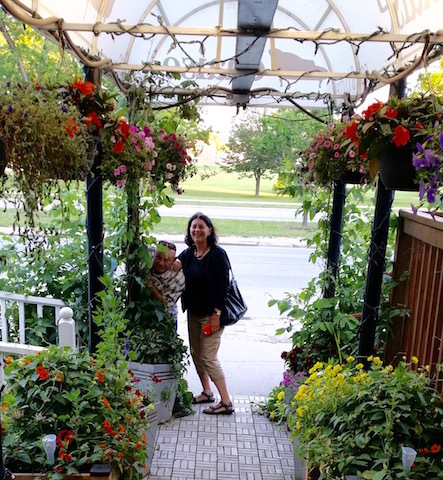 It’s a restaurant near our home owned by Obby Khan a retired professional football player who used to be on the roster of the Winnipeg Blue Bombers. 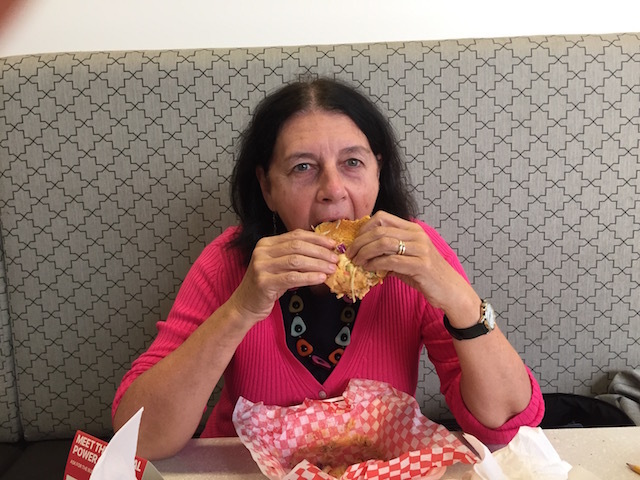 My husband Dave had read about their burger in the newspaper and it sounded delicious. It was made with lamb, beef and flafel and served on a sweet potato-poppyseed egg bun lined with melted mozzarella cheese. The meat patty was topped with roasted red pepper, seven-bean hummus, pickled turnips, sriracha coleslaw, caramelized onions and garlic sauce. The burger was fabulous as you can see from these photos. I needed lots of napkins to clean all that juicy goodness off my fingers while I ate. I LOVED the fries that came with the burger. They were crispy and spicy and hot. 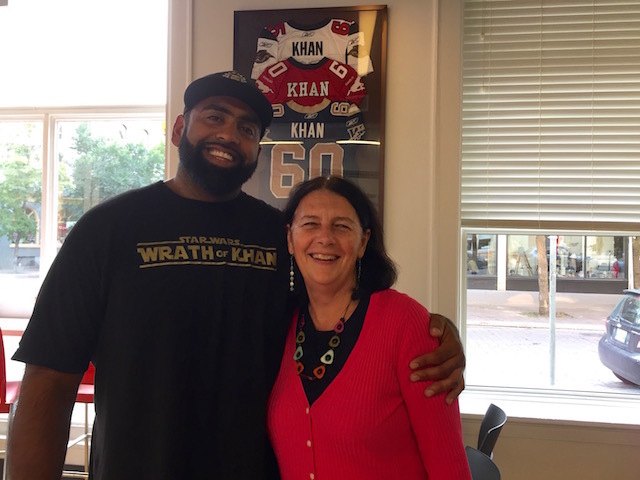 Owner Obby Khan came over to check how we were enjoying our burgers and Dave asked him to pose for a photo with me. Obby was happy to oblige. We may try another burger in the coming days since Burger Week lasts till Thursday. 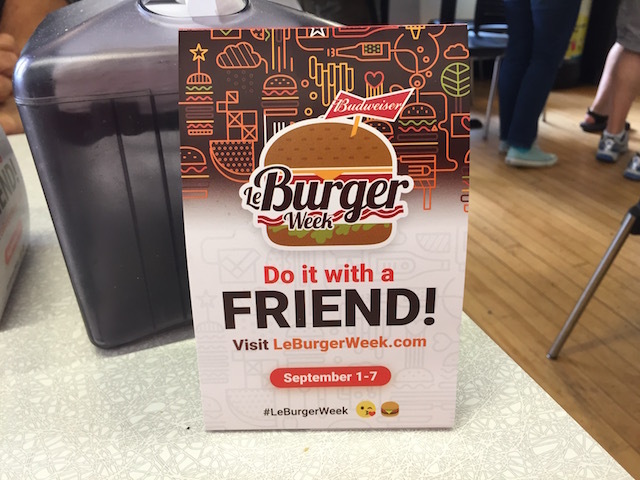 But the next time we are going to share a burger. 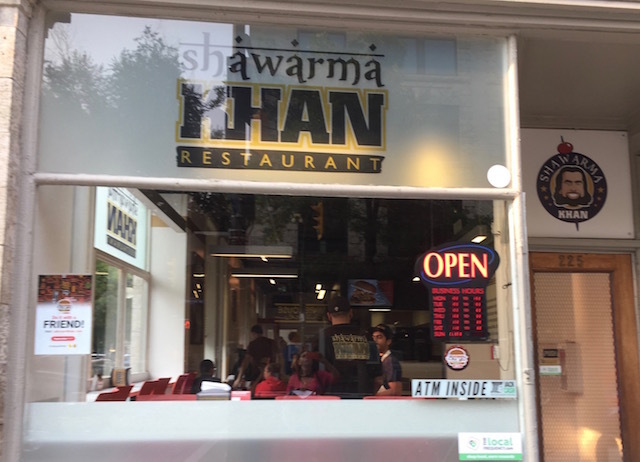 I was so full after that Shawarma Khan burger I could barely walk.